Proflamaid Plus is a truly unique joint and muscle supplement, which is highly effective, 100% natural and does not contain any banned substances. Its method of action is unlike any other on the market, combining natural pain relief mechanisms and potent nutritional support. Proflamaid Plus is Australia’s leading Joint and muscle supplement. 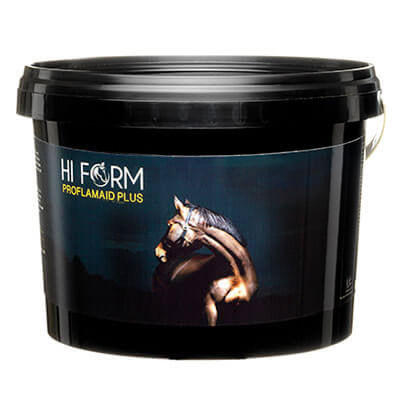 Hi Form have studied the inflammatory process and created Proflamaid Plus to work with the body instead of against it. The aim of Proflamaid Plus is to help shorten the inflammatory response (when tissue is damaged) and provide adequate nutrition for rapid healing. It can assist in maintaining healthy cartilage, tendons, muscles and bone. Proflamaid Plus will not mask pain or block pain messages to the brain, which can be detrimental in the long term. It can be especially useful in chronic cases or where the horse may have caused secondary injury through long term compensation and tension. These work alongside the essential amino acids, Vitamins B & C and mineral tissue salts, which also play a role in supporting the natural healing process and maintaining healthy joints. Doses can be increased to 48g a day for specific problem.